Just like a white shirt is a magnet for spaghetti stains, your sails are magnets for stains, dirt, and mildew. Unlike a white shirt, you shouldn’t bleach or machine wash your sails, it will ruin them. That means don’t clean them in a chlorinated pool, either. For hundreds of dollars, you can send your sails to a professional cleaning service like SailCare.com. They’ll come back looking great but if they also need ANY repairs (loose stitches, etc. ), you’ll be put on the spot to have them repaired and your cost can quickly mount. If your sails are old, they’ll still be old when they come back. Their cleaning process includes re-impregnating the fabric with resins but that just stabilizes the current shape of the sails, it doesn’t restore them to a like-new shape. Another options is for you to clean your sails at home. You can restore some of their brightness without causing permanent damage and without it costing you a lot. You only need a large, flat, clean space to work, some basic cleaning supplies, a little elbow grease, and some time. The process that I’ll describe below will clean your sail fabric but it won’t do much to remove the corrosion from hardware. If you also want to clean the hardware, do it first and then clean the sailcloth. The second, main cleaning will remove any temporary stains caused by the hardware cleaning process. You can spend hours hand cleaning each grommet, eyelet, and hank snap but there’s a much easier way using regular household white vinegar. Pour some undiluted, household white vinegar into a shallow bowl and submerge a group of one to three pieces of hardware (and the surrounding sail cloth) for an hour or so at a time for each group. The corrosion will completely dissolve away and the hank snaps will work smoother and easier. Look ma, no brushing! While each group of pieces is soaking in vinegar, place the previously cleaned pieces in a bucket of clean water to dilute and rinse out the vinegar and remove the blue-green high water mark that can be left on the sailcloth. Every hour or so, rotate dirty hardware into the vinegar, clean hardware into the rinse water, and do something else in between rotations. When you’re finished cleaning the hardware, then clean the sailcloth like described below. Place a clean, plastic, black or dark-colored 40 gallon garbage can where it will receive full sunlight to keep the water warm. Fill the garbage can with water (soft and warm but not hot, if possible). Add 2 cups of Oxyclean liquid stain remover and mix well. Do not add bleach or other harsh cleaners, which can damage some sail fabrics, bolt ropes, and thread. Completely submerge one sail at a time in the water and let it soak for 24 hours. You don’t need to agitate it. If some of the sail floats up out of the water, just turn the sail in the water from time to time to be sure everything gets plenty of time to soak. After 24 hours, remove the sail and spread it out flat on a clean, smooth surface. A deck made with composite planks works great if you have access to one. If your sail is bigger than your work surface, work on a small section at a time. While it’s still wet with the soapy water, lightly scrub the sail all over with a soft brush, paying extra attention to the seams, batten pockets, and stains. Thoroughly rinse with clean water (soft if possible). Hang the sail to dry. If you don’t have a huge barn like in the first picture, you can drape it over outdoor furniture, hang it from a flagpole, or whatever you may have so long as it keeps the sail off the ground and lets air circulate around the fabric until it dries. If you don’t have someplace at home to do this, take the sail to your sailboat on a windless day and hoist it to dry while you do other things. Just be sure you don’t store the sail while it’s still damp or mildew can set in. Store it loosely in a well ventilated space for at least several days to be sure all the moisture trapped between the layers of material in the corner patches has evaporated. It’s common for old sails to have small rust stains from coming into contact with a rusty anchor or chain laying on the deck. They will be there forever, unfortunately. There is no sure way to remove them after they get set into the cloth. 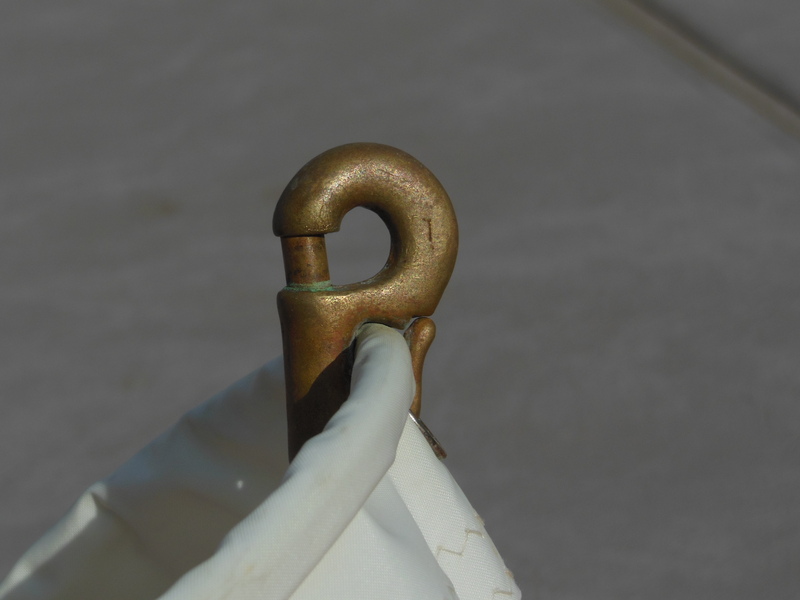 After you are done cleaning your sails and their hardware is a good time to do any necessary repairs. If you’re not comfortable making the repairs yourself, look for a reputable sail loft in your area. Most will give you a quick evaluation and cost estimate. 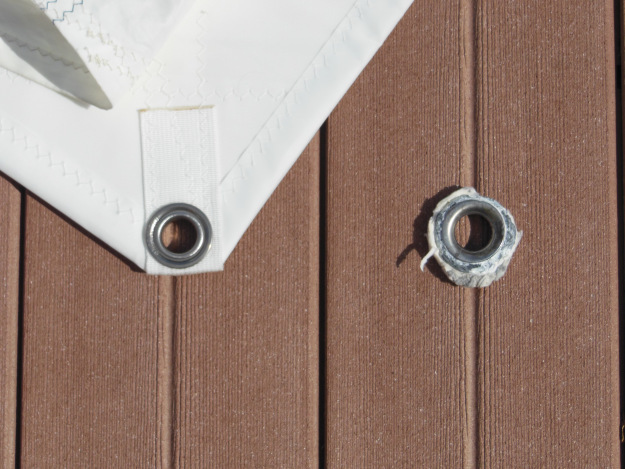 Damaged clew grommet before (R) and after (L) – probably stronger than the rest of the sail! If you discover that your sails are so old or damaged that they aren’t worth investing in repairs, consider buying new replacements from a quality online sail loft. For more information, read Product Review: Rolly Tasker Sails. After a thorough cleaning, your sails should look fairly clean. An annual light cleaning can keep them that way for the rest of their useful life and delay or avoid costly replacement. Another great idea, $tingy! It’s going to be my second task this winter after fitting that in-mast radio aerial cable after three years! Fantastic post, love the pragmatic and easy to understand steps. Have you ever dyed colors into a sail or can it be done? I purchased new sail this year and my old ones are decent enough to keep a hold of, but i was wondering if I could dye some colors in my old head sail. Thanks for your time. I haven’t done it myself, but I’ve read about others doing it like here: Dyeing Sails. Good luck and if you decide to try it, let us know how it turns out. Very careful use of Oxalic acid will remove rust stains.